We’re feeling ready for summer, as temperatures still remain cold, we’ve been dreaming of warmer escapes. Don’t get us wrong, we’re still loving our OFFICE boots but our wardrobe is ready for some sassy holiday sandals. Brands like Birkenstocks, Salt Water, Toms and our own OFFICE branded sandals are giving us all the summer feels right now. There are plenty of destinations around the world that are offering warmer temperatures, and why not get yourself out a winter funk and book a summer holiday? 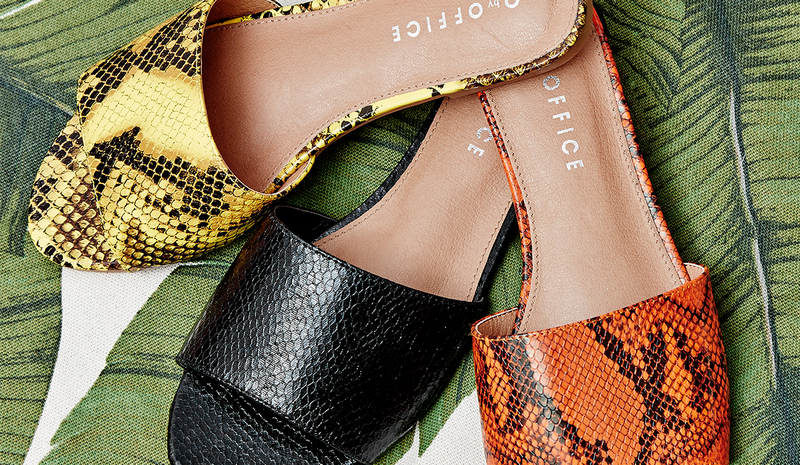 Whether your holiday sandal choice comes in a form of a slider, flatform, espadrilles or flip flop, we have a variety of silhouettes most suited to you. Your choice of holiday will determine your holiday sandal, whether its adventure focused or just resting by the pool, appropriate footwear is essential. We delve deeper into the shoe needs for your holiday, discover our recommendations of what’s best to pack for your holiday in 2019! 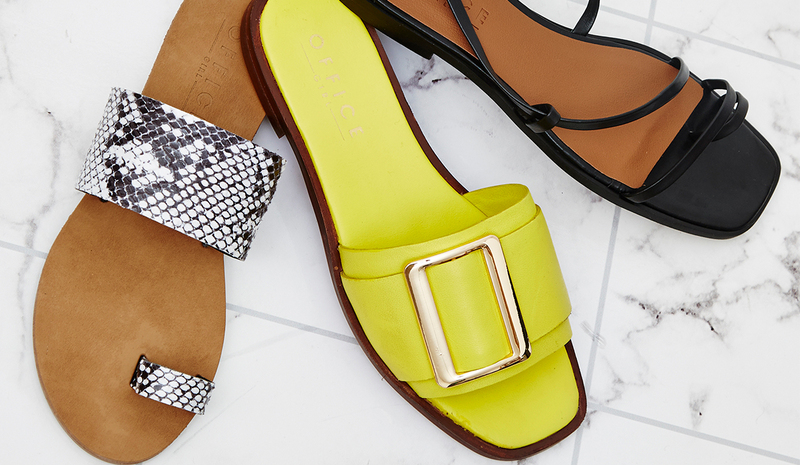 If you’re on the hunt for the perfect wedge sandal, we’ve got a great collection for you! Our wedge sandals such as Motional, Marsha and Honolulu are a firm holiday favourite, and we love that these black wedge sandals suit most holiday wardrobes. One of our many favourite features about a wedge sandal is the comfort and stability this silhouette brings. We love to pair our wedge sandals with flowing floral dresses or cute jumpsuits. If you’re looking to explore other colours, such as a white wedge sandal or low wedge sandal, styles like Maiden or Money honey are fabulous for anytime of day. Platform sandals are a great day to day shoe choice. They bring style and height to your summer attire. Whether you’re exploring the city or partying at night, pairing your black or white platform sandals are a great choice. Must Have, Mouse and Malmo are firm favourites. If you’re going out for some fun, Hey Day and Hyena are great platform heel sandals. We love an Espadrille sandal, the type of shoe that is perfect from day to night. The French/Spanish inspired shoe is popular throughout the world during the sunnier seasons. As an espadrille sandal is usually made up of canvas and cotton, the esparto rope sole is what creates its unique look. At OFFICE we stock a variety espadrille sandals, from platforms, wedges and flatfrom sandals. Styles like Marmalade, Half Moon, Mini Tie Up and Mexico are a few of our favourites. We love that most of our popular styles come in a variety of colours, such as black, pink, blue and silver. We love to wear our espadrille sandals or espadrille wedge sandals with wide leg jumpsuits, flowing bohemian dresses and always sporting a fun attitude. Espadrille flatform sandals pair well with denim shorts and white cotton shits. Height, sass and all the fun in elegantly styled heeled sandals. Not for all women, but heeled sandals are usually a winning formula to a great outfit for evening fun. The current trend of block heeled sandals are a fashion favourite, styles such as Hihi, Half Penny, Millions and Marrow are great choices for your fashion wardrobe. Not only giving you that height but maybe a bit more stability than and a stiletto heeled sandal. The gladiator made its first debut on the likes of Kate Moss and Sienna Miller, who brought these ancient sandal forms to life. Nowadays, a gladiator sandal is loved and adored by most during warmer seasons. We love a classic black gladiator sandal with jeans and cotton blouse. If you’re on the beach? Adding a touch of metallic to your footwear such as a gold gladiator makes for the perfect summer look. Styles like Shadow, Sardinia and Serpent are great Gladiator styles. If you’re looking to make a fashionable debut, why not explore the latest Dr. Martens Blaire sandals, a chunkier version of a gladiator sandal for women. Gladiator sandals are suited for those wanting a classic flat shoe, if you’re wanting more height, a gladiator heeled sandal like Huddle will be your perfect match. We always think a touch of sparkle is most necessary (all day, everyday!). Sparkly sandals complete an outfit. Sparkly sandals can be dressed up or dressed down, and always look ‘tres-chic’ with an all-black outfit. Styles such as Shaker, Skylight and Sweetheart are sparkly flat sandals, which pair well with cute jumpsuits or your go-to denim shorts and blouse look. If you’re wanting to be a bit more formal during the evening, styles such as Millionaire, Millions and Highball bring all the glitter fun to an outfit. Keep your outfit minimal (LBD) or black jumpsuit, and let the sparkle be the statement.